- COBRA is mandated for Employers with 20 or more employees but about 39 states and the District of Columbia have mandated some form of MINI COBRA for smaller employers. - For DC, the normal continuation of coverage for businesses with less than 20 employees is three months. - But Under federal American Recovery and Reinvestment Act of 2009 (“ARRA”) a subsidy of up to 65% of the cost of health insurance pursuant to the Consolidated Omnibus Budget Reconciliation Act (“COBRA”) health benefit provisions is provided. A COBRA eligible employee who has been involuntarily terminated between September 1, 2008, and December 31, 2009, and who earns less than $145,000 if single or $290,000 if filing jointly may receive this benefit for a maximum of 9 months. - ARRA also allows similar benefits for so-called mini-COBRA plans enacted by states to cover small group health plans. 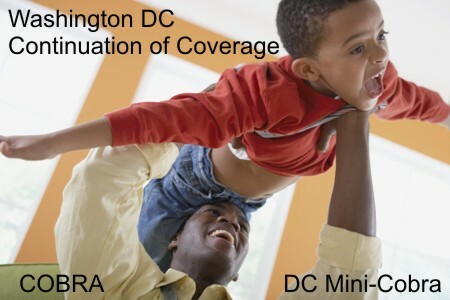 The District of Columbia Continuation of Health Coverage Act of 2002 meets the requirements for mini-COBRA plans and therefore this bill will 3 extend coverage for applicable employees to allow them to utilize the subsidy provided by the ARRA.